Specially developed for the lubrication of gears, cables and chains in open air and under water. This product provides extra protection against wear, rust and corrosion, even under the most severe operating conditions. This remains sticky and greasy. Provides strong adhesion and perfect co-and adhesion. The problem: Open gear mechanisms and sliding jibs of JJ are typically subject to adverse conditions including high service loads, exposed to the elements, and contamination from dirt and other abrasive materials. Wire ropes and chains are often exposed to corrosive conditions, and are subjected to abrasion and temperature extremes -20°C up to 150°C. Rapid corrosion and wear under these severe conditions, can cause excessive down time and high replacement costs. Use where steam or hot and cold water is a problem. For situations where lubricant ‘spatter’ or dripping is not acceptable. The action: Bardahl Transparent OGW Compound contains a unique compound to provide a protective lubricating film. The “polar-organic” compounds and extreme pressure agents, which are attracted to metal surfaces to create a tough, lubricating molecular layer that withstands high pressure and heat. The product clings strongly to the surface of metal, resists centrifugal “spin-off” and is highly water resistant. 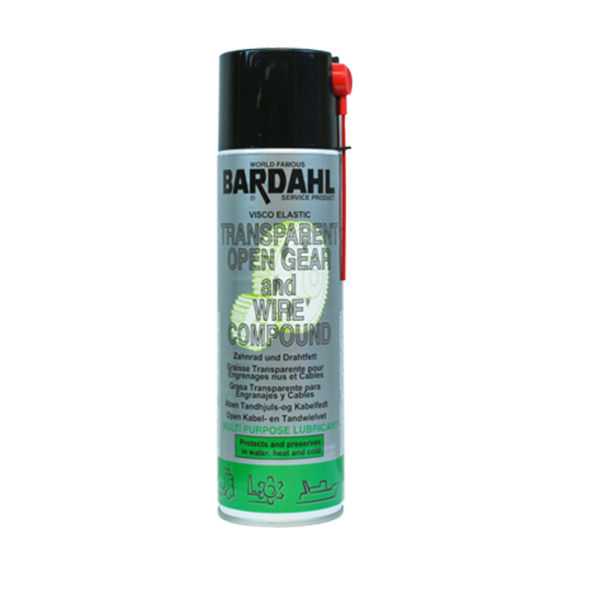 Bardahl Transparent OGW Compound is a penetrating lubricant for cables, wire houses and sliding jibs which provides a resilient coating that won’t be thrown off or washed out. On open gears, it provides a durable adhesive coating which protects against contamination, corrosion, and wear due to high pressure and heat. Bardahl Transparent OGW Compounds are ideal for protecting equipment such as turn buckles, shackles, cable clamps, exposed bolts, levers and switches against adverse environmental conditions.